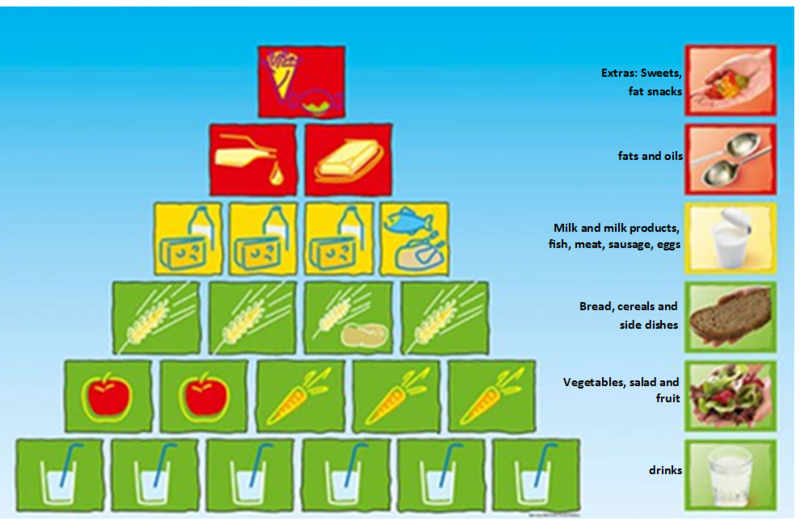 The following nutritional pyramid is complemented by aspects of sustainability. It provides food from the region or from fair trade, organic & seasonal food as well as a low processing (as fresh raw materials as possible). Taking these aspects into consideration, it is also possible to incorporate other decision-making criteria in the selection of food in addition to the nutritional values. More detailed information can be found in Unit 3. In order to provide us with all essential nutrients, a great variety is required. The diet should therefore be as diverse as possible. However, it is not just the choice of food, but the quantity also plays an important role. 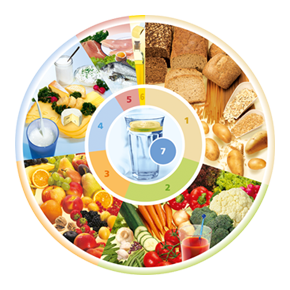 The DGE nutritional circle subdivides the rich food supply into seven groups represented by a segment in the circle. The different sizes of the segments illustrate the extent to which the different food groups should be represented in a full-fledged diet. The larger a segment of the circle, the larger amounts should be consumed from this food group. Food out of the small segments should be used sparingly. Drinks are the largest food group with a daily drinking volume of around 1.5 liters. Then follow the plant foods grain, cereal products, potatoes, vegetables as well as fruit. They form the basis of a full-fledged diet and supply carbohydrates, abundant vitamins, minerals, dietary fiber as well as secondary plant products. Animal products supplement the daily food plan in small portions and should be as low in fat as possible. They provide the body with high-quality protein (protein), vitamins and minerals. Fat and fat-rich foods should be consumed rather rarely. The quality plays a decisive role here, because vegetable oils mainly supply the essential fatty acids. Whoever selects from all seven food groups, takes account of the quantity ratio shown and uses the food diversity of the individual food groups, creates the best conditions for a full-fledged diet. For the pedagogical work with children, it has proved to be a good idea to change the nutritional pyramid into the food pyramid. The AID information service from Germany has developed many games around the nutritional pyramid and educational material, which are currently provided by the Federal Center for Nutrition (http://shop.aid.de/bundeszentrum-fuer-ernaehrung). 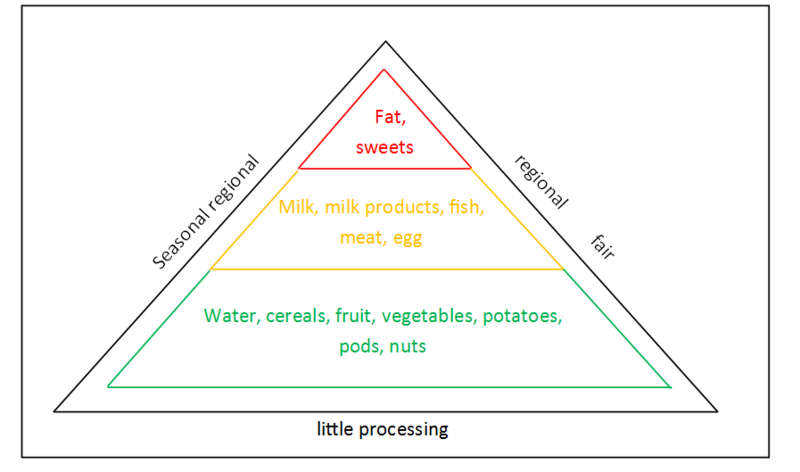 The amounts of food are shown in the pyramid as individual fields. Each field is a portion of each food. As an orientation, one assumes that a handful of the respective food should be consumed. Since a child's hand is smaller than the hand of an adult, the amounts match the calorie requirement. So, you should eat 2 hands full of fruit and 3 hands full of vegetables daily. 10% of the daily requirement Sweets, biscuits, salty snacks, sugar sweetened drinks, fat food (fries, croissants) - this is a recommendation and not a must!